When Alice is dragged to Scotland with the rest of her classmates for an activity-packed school trip, she is not expecting to have any fun. In fact, she is expecting it to be quite awful, especially when she and best friend Cass finds themselves stuck in a cabin with outcast Polly, quiet emo-girl Rae and queen of mean Tara. But nothing can prepare her for the nightmarish situation she finds herself into when Tara dies. Left with a terrible secret to bear, Alice’s world falls apart. Until Jack, Tara’s brother, lands into her life. But can Alice put her guilt aside to enjoy her burgeoning relationship? Cat Clarke is undoubtedly one of the most exciting and talented YA writers we have in Britain at the moment. I do not know what it is about her writing, I can’t quite put my finger on it, but it has an edge, a harshness mixed with real emotion that really appeals to teenage readers. I think it is because reminds of them of the emotional conflicts they go through. 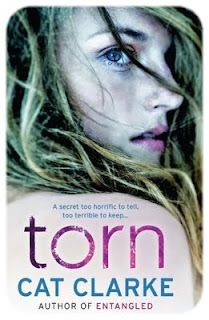 I had really enjoyed Entangled (see my review here), her début novel, but I think I like Torn even more. There is a lot for the intended audience to like in there: first love, friendships born and broken, intrigue and mystery, as well as a heroine who is likable but not perfect and a swoon-worthy young male character. The story is fast-paced, the writing snappy and in the right tone considering the age of the narrator (although the school librarian in me did wince at the amount of times the F word was mentioned!). Although it becomes gradually obvious who might be responsible for Tara’s death as the story progresses, I thought the final revelations were quite unexpected. The author leaves the reader with quite a bit of food for though: that nothing can ever be black and white, and that sometimes it is not quite as simple as innocent or guilty. It also questions whether not trying to help someone when death is inevitable otherwise is the same as actively trying to kill. “Still, I can’t help imagining some long-dead writer screaming from his grave, ‘THERE’S NO BLOODY SYMBOLISM! IT’S JUST A STORY'”. That’s exactly what I thought, all the way through the three years of my degree in literature! Entangled was a very promising first novel and with Torn, Cat Clarke does not disappoint and proves she is most definitely here to stay. This is exactly the type of British YA that every school library should have on its shelves. Thank you to Quercus for providing a review copy of “Torn”. Great review Library Mice… you’ve sold it to me. Have to order myself a copy pronto!